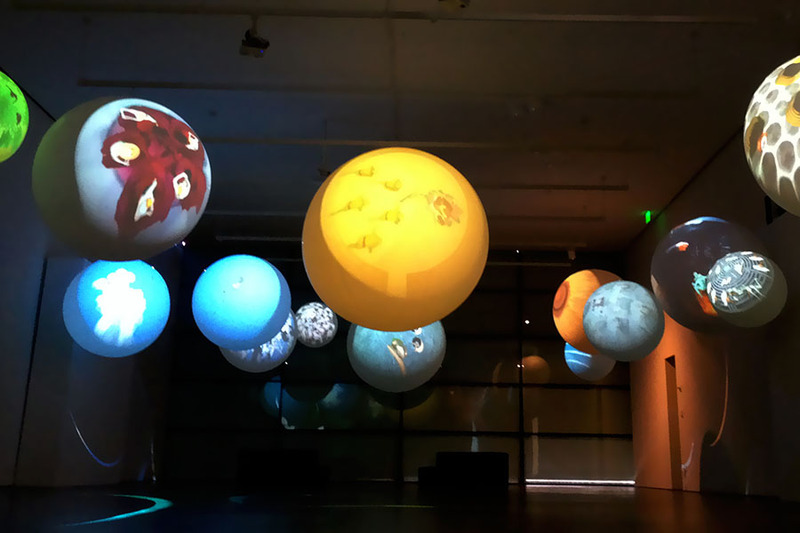 New York-based Swiss artist Katja Loher uses innovative video technology to create multisensory installations that convey the intricate and interconnected nature of life on Earth. In Videoplanet-Orchestra, Loher evokes a dynamic solar system by projecting fantastic images on large spheres floating in the gallery space. Each individual “videoplanet” is then synchronized to an audiovisual score to form a unified ensemble reminiscent of an orchestral performance. Central to the entire installation are the two “videoplanets” identified as the sun and the moon. 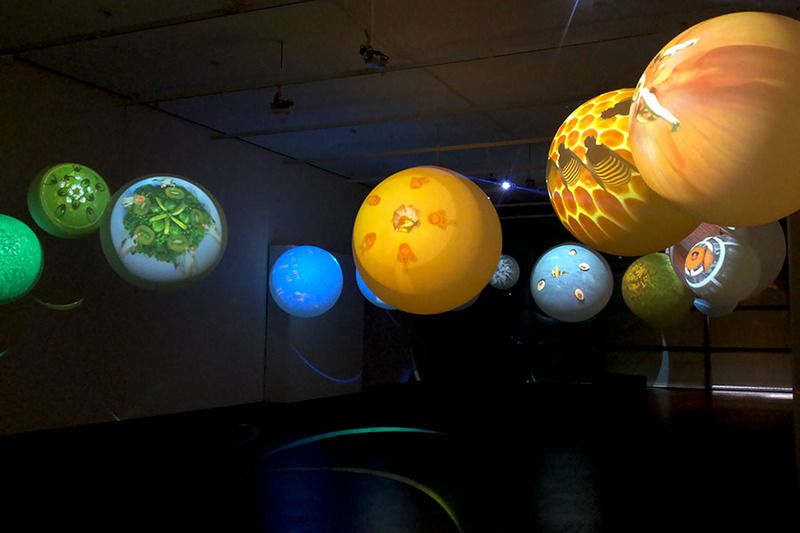 At one moment during the score, the “sun planet” at the center of the gallery sends out a host of “sun-creatures” that like rays of light illuminate the other planets in orbit around it. At another moment, the “moonplanet” located in the periphery drains the color from the planets until the entire gallery is cast into darkness. 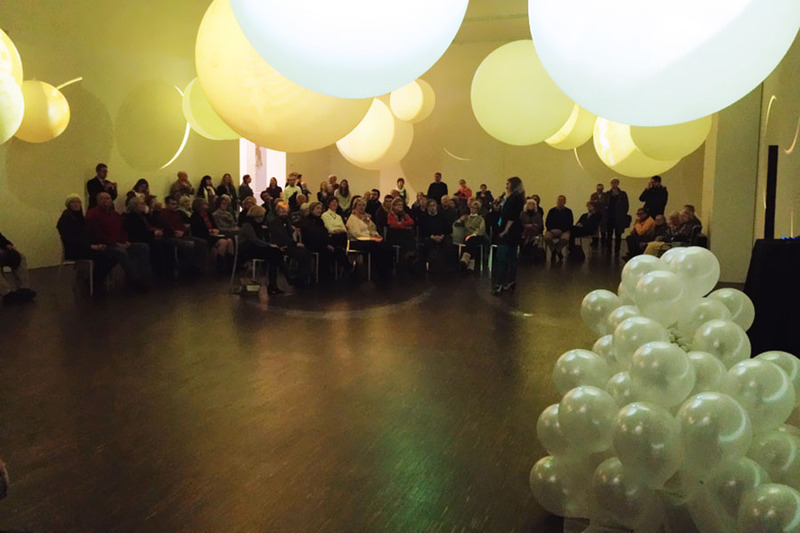 Loher collaborates with many people to create a unique experience for the viewer. She joins forces with dancers, choreographers, costume designers and other professionals to stage and film her magical worlds of androgynous characters performing precisely-coordinated dance routines. This model of collaboration mirrors the underlying theme of her videos: the health and wellbeing of the planet depends on a combination of individual initiative and collective effort. In her videos, dancers take on the role of a colony of bees carrying out their daily task of pollinating plants, or they act out natural processes like cell division or photosynthesis. Alternatively, they form abstract patterns or spell out thought-provoking questions. During the digital post-production process, these dance sequences are multiplied to create a mesmerizing kaleidoscopic effect. Loher adopts a bird’s eye perspective for each video to simulate the effect of looking through a microscope or a telescope. Assuming the role of a mere observer gazing at a distant reality, the visitor is invited to change his or her perspective on man’s impact on the environment. The questions directed at the visitor underscore his or her place in the greater universe.